When I was young I read the book Foundation by Isaac Asimov. It’s a science fiction book set in the distant future in which a scientist, by the name Hari Seldon, develops a new science called psychohistory which had the unique ability to foretell mankind’s future based on the merging of mathematics with psychology and history. That book made a big impression on me. Ever since then I’ve wanted to be among a select few who had foreknowledge of future events, perhaps for profit or simply to be prepared for what may lie around the bend. But, as I got older, I realized, it’s not possible to predict the future. Right? You can imagine my excitement when I came across a book that professes the ability to predict the future. This book is non-fiction, not fiction. It’s based primarily on sociology and history, not mathematics and psychology. And it was written in my lifetime (1997, to be exact), not in the distant future. 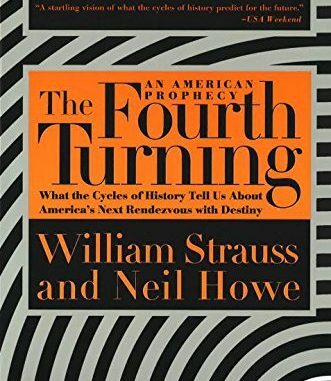 The name of the book is The Fourth Turning: An American Prophesy, What the Cycles of History Tell Us About American’s Next Rendezvous with Destiny. The books’ authors are William Strauss and Neil Howe, both sociologists by training. Every saeculum cycle allegedly ends in a crescendo of crisis, typified by something like a major war, economic depression or both. Just as winter turns to spring, providing nature with an opportunity for regrowth and development, the crisis at the end of each cycle provides society with an opportunity to start anew. In the case of cycles ending in war, we put out the fires and begin to rebuild our infrastructure, homes and factories. In the case of cycles ending in economic collapse, we reset the existing currency or introduce a new one, and embark on regulatory and/or fiscal reforms intended to never allow the same mistakes to occur again. But, as time passes, we forget about the dangers we just harrowed and fail to appreciate the reforms that were instituted in their wake. We begin to take more risk or engage again in bellicose actions. And it’s quite easy to do this because, with the passage of time, elders die off and the new leaders of society are those who either didn’t experience the last crisis or were too young to remember it. They have, in a sense, forgotten history and are now repeating it. I’ve seen this “forgetfulness” very much in my own life. When I was very young I spent large portions of my adolescent summers directly with my grandparents in Pennsylvania who, only three decades earlier, had weathered the struggles of World War II. From their relatively recent experiences with rationing and hunger, they taught me to finish all the food on my plate and to turn off the lights when I left a room. They would have been among the last people on the planet to flippantly comment that we needed to drop a bomb on this or that country or teach some foreign dictator a lesson. And now, in my adult years, I’m often surrounded by the opposite. I see at restaurants people that will order an additional dish just to try a few bites of it and leave the rest behind. Energy conservation is something not frequently discussed in my circles, except perhaps to belittle it as something we don’t need to worry too much about in our era of successful abundance and scientific progress (…oh, unless it comes up in the context of “climate change;” but don’t get me started on that….) And I can’t tell you how many colleagues and neighbors have made comments in the past decade about why we needed to “take out Saddam Hussein,” why we now need to “take out Bashar al-Assad” of Syria (comments I find sadly ironic, given that most of them probably couldn’t have picked out Syria on a world map a few years earlier), and I suppose I’ll increasingly hear more soon about why we need to drop a bomb on Russia to keep them in check or in retaliation for their supposed “elections tampering.” So, to summarize, yeah, we humans can forget an awful lot over just a 20-40 year period as elders die off and their children and grandchildren come to hold the reigns of societal power and community decision-making. Much of what I’ve just directly quoted from the book is reminiscent of the anti-establishment counterculture during the 1960s and 1970s which at times reached levels of anarchy on college campuses. America’s most recent experience with an Awakening was, according to the authors, the years 1964 to 1984. Social commentators have pointed out that period’s rebelliousness as a reaction to the button-downed conformity of the post-World War II period. Individuality and spirit began to burst forth where before, in a period characterized as a response to Crisis, cohesion and uniformity were necessary or cherished. But, while there is much ongoing in our society right now that marks a distinct parallel between current events and Strauss and Howe’s description of a typical fourth turning, there are still very many things which are reminiscent of a typical third turning, or Awakening. For example, where gender differences should have been very narrow in Unraveling and widen in the Crisis, I’m not so sure that is happening. Perhaps I’m not as in tune with the ongoing evolution in gender issues, but from my perspective, they seem to be narrowing further. Think about Caitlyn Jenner, the recent “public bathroom debates” in legislative assemblies like North Carolina stipulating who can use female bathrooms and who can’t, the fact that Facebook (I heard) not that long ago offered users as many as 58 different gender options to pick from while setting up their profiles, and elementary-aged children are now taught that it’s understandable and acceptable to “self-identify” with whatever gender suits you most regardless of the anatomical plumbing the Creator gave you. I could be wrong, but I don’t think Strauss and Howe’s description of gender roles in a fourth turning are matching up with modern American society. So, am I saying Strauss and Howe are wrong? No. For one thing, the nature of their science is to paint with broad strokes, and if you squint too closely at a painting, you’ll see some imperfections. Besides, I’m not expert at all of the gender developments underway in our society right now, so I’m not even sure they’ve missed here. But, even if they have, I’ll grant them a few misses given their very large endeavor. Perhaps more to the point, I also think there’s a possibility that the lines between an Unravelling and a Crisis are not so distinct. We may have passed the “Trump-optimism/government-leads-again” marker, but haven’t yet shaken off –what’ I’ll call– the “anti-social, anti-Capitalist, gender-confused nonsense” that took hold amongst an entitled and pampered generation that always got a trophy and never came to know what failure tastes like. 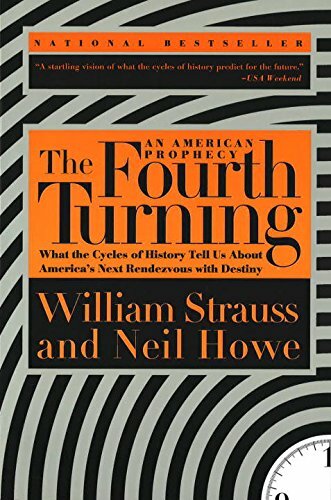 Perhaps when the bombs really start falling and/or the fiat currencies really start vaporizing, they’ll wake up and get with the program and our society will be more fully transformed to the fourth turning Strauss and Howe predict. There are so many other things that Strauss and Howe cover in their book that I think are worthwhile to read and ponder. Let me highlight just a few. First, they give many facts and examples from prior times to show that saeculum cycles have been at play in our society for several centuries. For example, their fourth turnings, or Crisis periods, dating back to the mid-1400s, show that some major cataclysm has occurred roughly every 80 to 100 years, beginning with the “War of the Roses” (1459-1487), the “Armada Crisis” (1569-1595), the “Glorious Revolution” (1675-1704), the “American Revolution” (1773-1794), the “Civil War” (1860-1865) and on up to the already discussed “Great Depression and World War II” (1929-1946). If you pick the single year within each time range that they think is most representative of the peak of that particular turning (1485, 1588, 1689, 1781, 1863 and 1944), the periods of time between each one have gone as follows: 103 years, 101, 92, 82 and 81; or, roughly speaking, within an 80 to 100 year generational cycle for each. (Note also that the saeculum cycles are hastening, or becoming shorter over time, too, which is interesting. Is time speeding up? Or are society’s technological developments and increased communications causing responses to occur more quickly?) Assuming another 80 or 81 years from the peak of 1944, this implies we’ll be in the maelstrom of our next Crisis in the year 2024 or 2025, if Strauss and Howe are correct and the cycle holds up. Good news, I guess…. we appear to have plenty more time to buy physical gold and freeze-dried food products, and to consider moving to New Zealand or Costa Rica!! Strauss and Howe also give copious examples of how Highs, Awakenings, Unravelings and Crises have all shared their own respective similarities in times past. Not having lived through them, or spent much time reading about those historical periods, I’ll have to take it on faith that what they describe is accurate. But, they describe periods of time in the past where consciousness and spirituality has blossomed during Awakenings, such as the “Protestant Reformation” (1517-1542), the “Puritan Reformation” (1621-1649) and the “Transcendental Awakening” (1822-1844). Besides the reconstruction after World War II, there were Highs such as the “Tudor Renaissance” (1487-1517) after the War of the Roses, the “Era of Good Feelings” (1794-1822) after the Civil War, and the “Reconstruction and Gilded Age” (1865-1886) after the Civil War. I’ve already discussed periods of malaise and low points during Unravelings just prior to the Civil War and Great Depression. To validate their theory, the authors offer dozens of pages of examples using facts and evidence from the past to show that turnings share commonality with related turnings across various saecula (the plural form of saeculum). Finally, there’s also an interesting concept of “archetypes” weaved into these four turning cycles. Archetypes run throughout history, for all of mankind’s history. They can be found in ancient writings (such as Homer), ancient mythological tales (Roman, Greek, Hindu) and in the Bible and other religious documents. They can even be found in contemporary stories like Superman and the Star Wars trilogy. Archetypes tend to come in a pattern of “pairs” and “fours.” Throughout history, you often have a young hero paired with an elder prophet. Examples include King Arthur and Merlin in the Celtic myth, Siegfried and Hildebrand in the Teutonic myth, Horus and Thoth in the Egyptian myth, Moses and Joshua in the Bible, Frodo and Gandalf in the Tolkien trilogy, Luke Skywalker and Obi-Wan Kenobi in Star Wars and Simba and Rafiki in The Lion King. These are but a few examples, but look closely and you’ll see archetypes EVERYWHERE. Strauss and Howe believe four archetypes are present throughout time, playing roles in the four turnings of the saecula. The four archetypes Strauss and Howe identify are the Hero, Artist, Prophet and Nomad. Heroes tend to be hubristic, powerful, heroic, kingly and war fighting. Artists tend to be empathic, sensitive, administrative, deferential and adaptive. Prophets tend to be moralistic, wise, indulged, narcissistic, populistic and revolutionary. Finally, Nomads tend to be alienated, abandoned, anarchic, pragmatic, cynical and tough. At any given time in a society, you have those that are entering childhood. They are aged 0 to 20. The next tier of development is those entering young adulthood. They are aged 21 to 41. Next is those entering midlife, aged 42 to 62. And finally, you have those entering elderhood, aged 63 to 83, approximately. “A Prophet generation grows up as increasingly indulgent post-Crisis children, comes of age as the narcissistic young crusaders of an Awakening, cultivates principle as moralistic midlifers, and emerges as wise elders guiding the next Crisis. A Nomad generation grows up as under-protected children during an Awakening, comes of age as the alienated young adults of a post-Awakening world, mellows into pragmatic midlife leaders during a Crisis, and ages into tough post-Crisis elders. A Hero generation grows up as increasingly protected post-Awakening children, comes of age as the heroic young teamworkers of a Crisis, demonstrates hubris as energetic midlifers, and emerges as powerful elders attacked by the next Awakening. As I pointed out earlier, I was a bit surprised that this book, written in 1997, seemed to foretell so well a lot of things that have happened from 2000 to the present. I hope I’m just as pleasantly surprised to find Strauss and Howe’s prediction that the coming-of-age Millennial generation (born approximately from 1981 to 2004) will appropriately shepherd us through the next, imminent crisis. No one wants to go through a Crisis, but if we have to, I sure hope Strauss and Howe are right about this Millennial generation’s ability to spring into action for the greater good. I guess we’ll soon see. I don’t think we have too long to wait to find out. Until then, buckle up everyone! The Crisis will soon be upon us. And then, perhaps as our reward for weathering it, we’ll get to experience a new American High.